The Goliath is the second 'Mech, built in 2652 by Brigadier Corporation. The Goliath is based on lessons that were learned from the Scorpion. The first and most important difference is that the Goliath weighs in at 80 tons allowing it to carry a much heavier weapons payload and armor at the cost of mobility. 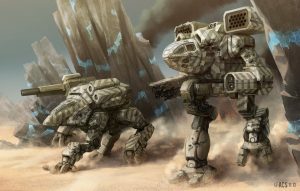 The Goliath is used as a general assault 'Mech and until recently was not usually seen in large numbers because of the bias against quad 'Mechs prior to the 3060s. In the late 3060s the Goliath saw renewed production and renewed popularity and has since become a powerful and respected assault 'Mech. 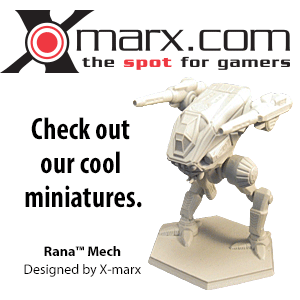 The Goliath is armed with what would be considered a paltry armament for a 'Mech of its size. The primary weapon is a Rand PPC. This is backed up by two Holly LRM-10 launchers. The Goliath has respectable firepower at long ranges. When an enemy closes though the 'Mech only has two Ramsey-65 Machine Guns to rely on for defense. Sirocco - At the beginning of the renewed interest in quad BattleMech technology, Corean Enterprises decided to design a replacement for the aging Goliath. The result was the Sirocco assault BattleMech. Fiona Cochraine: Colonel and commanding officer of Cochraine's Goliaths. She lead his unit during the battle of St.Andre, defeating easily the First battalion of Light Davion Guards, but they were then attacked by the light mechs company lead by Andrew Redburn. He identified the colonel mech because of his insignia, and to save another Mech in danger, he made a Death from Above attack over Fiona's mech, destroying it and killing her. The (original) Goliath variants and artwork from 3025 were part of the Unseen 'Mech designs. The Goliath was Reseen in 3067 with new variants using revised artwork.